Winkelmann, R., A. Levermann, A. Ridgwell, and K. Caldeira, 2015: Combustion of available fossil fuel resources sufficient to eliminate the Antarctic Ice Sheet. Science Advances, 1, e1500589, doi: 10.1126/sciadv.1500589. The Antarctic Ice Sheet stores water equivalent to 58 m in global sea-level rise. We show in simulations with the Parallel Ice Sheet Model that burning the currently attainable fossil fuel resources is sufficient to eliminate the ice sheet. 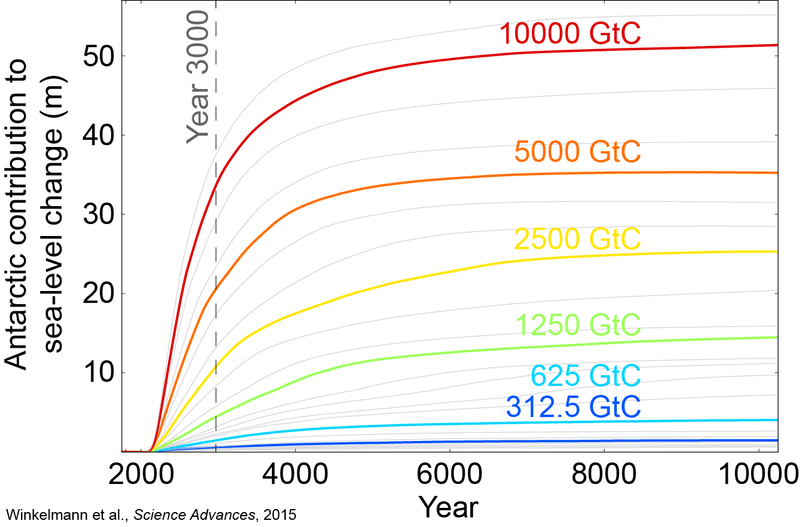 With cumulative fossil fuel emissions of 10,000 giga–metric tonnes of carbon (GtC), Antarctica is projected to become almost ice-free with an average contribution to sea-level rise exceeding 3 m per century during the first millennium. Consistent with recent observations and simulations, the West Antarctic Ice Sheet becomes unstable with 600 to 800 GtC of additional carbon emissions. Beyond this additional carbon release, the destabilization of ice basins in both West and East Antarctica results in a threshold increase in global sea level. Unabated carbon emissions thus threaten the Antarctic Ice Sheet in its entirety with associated sea-level rise that far exceeds that of all other possible sources. Figure 1. Ice loss from Antarctica (in meters sea-level equivalent) in response to warming of the atmosphere and the Southern Ocean, simulated with PISM.